GardenDesk: My 25 Favorite Gardening Books! My 25 Favorite Gardening Books! As you probably already know, I am obsessed with gardening. My friends, neighbors and family know that I live gardening. Many times they ask my advice on gardening matters and ask me how I know so much. That has surprised me in the past because I don't think of myself as knowing all that much more than the next gardener. I don't have a formal horticulture education except for a few month long Master Gardener Program 13 years ago. So where have I learned what I know about gardening? Of course much knowledge comes from gardening a lot. After pondering this question a bit, I would have to say that most of what I know came from reading about gardening from great organic gardening books! If you've been reading this blog for very long, it doesn't surprise you that I am really into gardening books. I often reference the book that I learned things from like when I built our coldframes and where I got the plans for our greenhouse and other posts. To put my top 25 in some kind of order, I thought I'd share them in a few different categories and say why they are my favorites. First, I have to mention The Rodale family of organic gardening books. These have been invaluable to me over the years. First is the Encyclopedia of Organic Gardening: The Indispensable Resource for Every Gardener . I listed the subtitle because to me, it is so true - especially if you want to garden organically. I just picked up a new Rodale Organic Gardening resource encyclopedia from the discount bin and it also has great info. Next, 50 Years of The Best of Organic Gardening Magazine is great! It was published back in the Mike McGrath days and features the best vegetable articles from OG magazine. The last two are classics that deal with composting and organic insect and disease control. 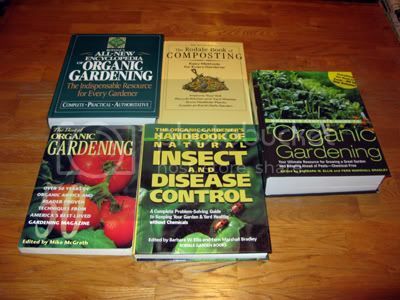 They are The Rodale Book of Composting and The Organic Gardener's Handbook of Natural Insect and Disease Control . I use all of these Rodale books as constant reference books. This nest group is my favorite "fun" group. They have much more personality than the Rodale books. Four of them are from two of the most famous gardeners - Mel Bartholomew and Eliot Coleman. These are must haves in a vegetable gardeners tool box. Most people are familiar with Mel Bartholomew's Square Foot Gardening book, but did you know that he wrote a newer one called the All New Square Foot Gardening . In it he reports the discoveries he's made by square foot gardening for so many years. He makes some changes to his original methods which are great improvements. I haven't discarded his old book however, because it has better vegetable descriptions and spacing charts. 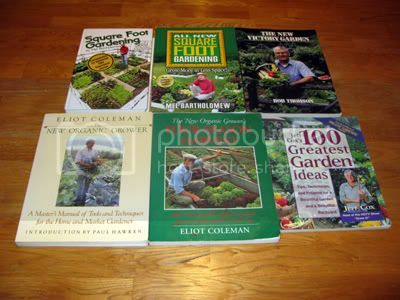 Eliot Coleman's books are Four-Season Harvest and The New Organic Grower. I could write a whole post about the wisdom of Eliot Coleman and what a great teacher he is. Coleman has influenced my gardening more than any other author. I often mention something from him like when I write about season extension or soil blockers. The last two are my first gardening book, The New Victory Garden which I have written about many times before and Jeff Cox's 100 Greatest Garden Ideas. I used to love watching Jeff Cox's TV shows "Grow it" and "Your Organic Garden". Incidentally, Elliot Coleman had a great TV show as well called "Gardening Naturally". Sorry - off topic a bit. Easy to do when I start writing about all of my heroes in gardening. Anyway, Jeff Cox's book is a compilation of great tips to make your gardening better like how to keep Raccoons out of your corn. That is one I will be trying this year. I demonstrated it in last year's post about the Raccoons eating my corn! Wow, this post is getting to be longer than I expected and I've not even covered half of my favorites yet! If I continue I'll either bore you to death, or rush through the rest with out writing much about the books. I think a part two is in order, don't you? And My Master Gardener Notebooks! Soon I will post "Favorite Books, part 2" to explain why these books are so significant to me. Until then, I would love to hear what your favorite gardening books are. I know of at least a dozen more popular gardening books that could have been on this list. I do like a lot more books than this but these are the most significant to my garden. Thanks for this great post, as a fellow gardening book enthusiast I was most pleased to discover a couple books I have yet to read. Gardening Under Plastic and Solar Gardening, Growing Vegetables Year Round have been added to my wish list. I went to the bookstore during my lunch to look for the Composting book and the Four Season Harvest book but alas, they did not have them. Since I'm from New England but live in Florida, I have noticed how northerner's seem to grow gardens more. It's a shame because Florida has such great sunny weather. But because of this fact most of the great books seem to come from north of the Mason-Dixon! You might say "so what, what's the big deal?" Well, Florida has such great weather that it's actually.......unusual. So unusual that when Floridians want to read about gardening it's hard to find accurate info. I mean, we don't start our tomatoes in June!Now I'm not crying! Just sayin'! lol. Anyway, I have learned from most of the books you have listed, especially "The Vegetable Gardener's Bible", but I recommend "Vegetable Gardening In Florida" by James M Stephens, for you Gators. Hi Marc-this is Sharon from Simple Green and Frugal-I need to update your feed and could you please e-mail me-I am having a bit of a time trying to get the roster to you. Thanks ever so much. I've often wondered what my knowledge level is compared to someone who has just spent time in a professional horticultural college! I have been a keen, self-educated amateur gardener for more than 40 years. I love reading gardening books then putting it to the test. I bet we would give those professionals a run for their money, eh? Many of my favs there too. Can I include as indispensible: Seed to Seed by Ashcroft and Deppe's book on amateur plant breeding? I like garden and reading the garden book. I make small garden in my home. So i always take care to my garden and i just find the best gardening book and you meet me so i never control to myself for the commenting. Thanks for the post.